China has a track record of failure when it comes to investing in iconic U.S. brands. Back in May 2007, China's State Investment Company got a $3 billion stake in Blackstone Group (BX) ,which at the time was the preeminent private equity firm, at 95.5 percent of its $31 a share IPO price. Since then, its stake has lost 64 percent of its value. 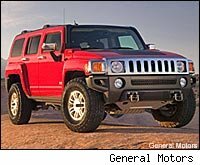 Now China wants to buy the old General Motor's Hummer brand -- but this deal is likely to end in tears. Unfortunately, the U.S. and China are so dependent on each other that such mistakes are inevitable. China owns $1.2 trillion worth of U.S. debt the value of which declines along with our dollars. American companies used to import cheap products made by Chinese workers and U.S. consumers would use credit cards and housing debt to buy up those Chinese-made consumer products. Meanwhile, China has problems of its own. It is really two countries -- about 300 million people near the coast who are getting wealthier thanks to this economic bargain and about a billion people in the countryside who are dirt poor. Since the U.S. went into recession in December 2007, China has been closing factories and laying off workers -- about 10 million of them have fled back to the poor countryside -- and this creates significant political unrest in China. Many Chinese are upset that China is investing its trade surplus in the U.S. instead of creating a more consumption-driven economy like the U.S. has. They are also upset that China has decided to invest in U.S. bonds which are likely to drop in value along with the dollar as we keep running huge deficits and printing more money to bailout our failed banks and auto companies. In this context, China's Sichuan Tengzhong Heavy Industrial Machinery's decision to buy Hummer looks like an irrelevant side show. And there will be cultural and management problems which will make it awfully hard for the new Hummer to make money. Tengzhong manufactures heavy industry vehicles, highway and bridge components, construction machinery and energy equipment. It has no experience with U.S. consumer marketing or consumer product design. Tengzhong will keep Hummer's core management and operations team and existing dealership network. And it plans to invest in R&D to allow Hummer to better meet demands for more fuel-efficient vehicles in the U.S.
Is the industry attractive? The market in China might potentially be attractive but in the U.S. those Hummers, with their six miles to the gallon, are over-priced and too expensive to operate. Will the combined company be better off? Tengzhong does not bring the consumer marketing and product development skills needed to build a much-lower-priced, fuel efficient Hummer so the combined company will probably not be better off. Is the price low enough to leave room for a return on investment? The price has not been disclosed but I am betting it was the highest of all the bidders so it will be tough to get a return unless Tengzhong can make Hummer profitable. Can the acquirer integrate the target? It is highly unlikely that Tengzhong will be able to overcome the cultural and management hurdles needed to get the two companies to work together seamlessly. That's why this Hummer deal looks to me more like an ego play by Tengzhong than a strategic investment. And in the context of the broader economic coupling between the U.S. and China, even if it fails it won't make that much of a difference. Peter Cohan is president of Peter S. Cohan & Associates. He also teaches management at Babson College. His eighth book isYou Can't Order Change: Lessons from Jim McNerney's Turnaround at Boeing. He has no financial interest in the securities mentioned.